Abstract: The lack of communication among physicists, ecologists, and economists can be mostly attributed to the type of mathematics economists use as well as their study of flows of money rather than stocks of real wealth. This paper presents the essential characteristics of a new framework of economic analysis, Concordian economics, which uses standard mathematics and geometry and observes stocks as well as flows of real and monetary wealth. This paper thus attempts to build bridges among the relative disciplines, because it is becoming increasingly clear that vexing problems of human and natural ecology can be solved only through collaboration among economists, physicists, and ecologists. each the splendor of its full potential. stocks of real wealth, economists are mainly concerned with flows of money . (Ibid., 316). Since the structure of these models is selfsimilar, they are omitted here. Figure 1 represents the economic process at the moment of the exchange—as in mainstream economics, but with an enlarged focus. The unit of account can be the economy of an individual person, an individual firm, the local, the national, or the world economy. Figure 1 reads as follows: When goods and services pass from producers to consumers, monetary instruments of a corresponding value pass from consumers to producers. For the exchange to occur, the transactors must be the owners of both money and real wealth. Then, one cycle of the economic process is completed. As can be seen, Concordian economics is wholly relational and inherently dynamic. This second characteristic becomes more explicit if one sees each rectangle of Figure 1 as a Poincaré section. In Figure 1 the economic process is observed at one static moment in time. where p. = rate of change in the production of real wealth, d. = rate of change in the pattern of distribution of ownership rights over real and monetary wealth, and c. = rate of change in the consumption or expenditure of monetary wealth. 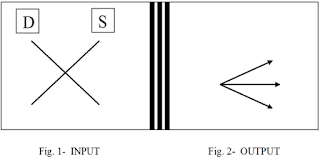 With Figure 2, we are not only within the economic process—an area that is a black box to mainstream economics ; we have also found the inlets and outlets requested by physicists. The inlets are flows of real and monetary wealth; the outlets are consumer goods, goods hoarded, and money hoarded. It is only capital goods and money to purchase real wealth that remain permanently within the system. The flows of the legal/institutional economy are fully inserted in this construction: They are invisibly present at the moment of the exchange. In order to buy and sell wealth one has forever had to have ownership of that wealth. Indeed, to think of the extreme complexity of the reactions that occur within the economic system, the reader is encouraged to mentally close the two halves of Figure 2 thus creating the image of a torus or a cyclotron. In the reality of daily life, stocks and flows of real and monetary values do not organize themselves into neat patterns, but tend to intermingle and interact with each other. The third approach is the longitudinal/programmatic one, through which one obtains an external view of the economic system as a whole. This is a new perspective that yields a simplified understanding of other characteristics of the economic system. 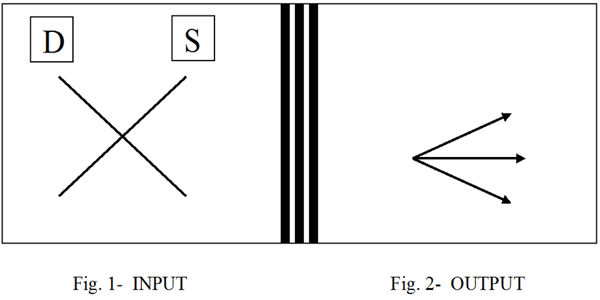 This mode of analysis can be briefly described as follows: If the economic system were composed of three identical, synchronous, and compenetrating spheres (obtained by rotating each rectangle of Figure 1 at ever increasing speed and in all directions about their geometric center), the system would leave behind only one trajectory as an indication of its dynamics. This line—whatever its pattern—would indicate that the three spheres were in continuous equilibrium with each other. This is not the case in economics: As Mandelbrot (1983, 1)  is fond of saying, "Clouds are not spheres, mountains are not cones, coastlines are not circles, and bark is not smooth, nor does lightning travel in straight lines." Can economic systems be expected to be represented by perfect solids? The distance between RW and MW will eventually yield the mathematical measurement of the “bubble”. Current efforts to identify the bubble are especially intense ; physicists adept at chaos theory have been investigating this issue for quite some time . Area "a"—with its alternative subareas a' and a''—attempts to describe the condition of disequilibrium (the bubble) that so often develops between monetary and real wealth and suggests that the smaller this area, the smaller the loss of real income over time. How to close the gap between the real and the monetary economy in the shortest possible time is clearly a problem of control, namely, a problem of economic policy—the problem of creating a just and sustainable economy. There is much work to be done. As can be seen, the intellectual framework is mostly done; it is the practical work that is all to be done. This is the work of organizing the data in accordance with the categories of thought specified above; this is the work of analyzing the data with the assistance of modern tools of scientific research. The tempi for the performance of this work can be enormously speeded up if physicists, ecologists, and economists assiduously work together . Gorga, C. (forthcoming), “Concordian economics: Tools to return relevance to economics,” Forum on Social Economics. Nadeau, R. L., The Environmental Endgame: Mainstream Economics, Ecological Disaster, And Human Survival, Piscataway, NJ: Rutgers University Press, 2006. Daly, H. E., Bouckaert, L., Opdebeeck, H., and Zsolnai, L., Frugality: Rebalancing Material and Spiritual Values in Economic Life, Oxford, Bern, Berlin, Bruxelles, Frankfurt am Main, New York, Wien: Peter Lang; pp. 207-226, 2008. Gorga, C., The Economic Process: An Instantaneous Non-Newtonian Picture, University Press of America, Lanham, Md., and Oxford, 2002. Gorga, C., “On the Equivalence of Matter to Energy and to Spirit,” Transactions on Advanced Research Vol. 3, N. 2: 40-45, 2007. Thompson, J. M. T., Nonlinear Dynamics and Chaos, Geometric Methods for Engineers and Scientists, New York: Wiley, 1986. Petrongolo, B., Pissarides, C. A., “Looking into the Black Box: A Survey of the Matching Function,” Journal of Economic Literature, Vol. XXXIX: 424, 2001. Mandelbrot, B. B., The Fractal Geometry of Nature, New York: W. H. Freeman, 1983. Because of its guidance from Ben Bernanke, most notable these days is the work done at the Bendheim Center for Finance at Princeton (Princeton Weekly Bulletin, May 26, 1997 and ff.). See much work done at the Santa Fe Institute. Matthews, E., The Weight of Nations: Material Outflows from Industrial Economies,Washington, D.C.: World Resources Institute, 2000. Carmine Gorga is president of The Somist Institute. The mission of the institute is to foster sensible moral leadership. He is a former Fulbright scholar and the recipient of a Council of Europe Scholarship for his dissertation on “The Political Thought of Louis D. Brandeis.” By inserting Hoarding into Keynes’ model of the economic system and using age-old principles of logic and epistemology, in a book and a series of papers Dr. Gorga has transformed the linear world of economic theory into a relational discipline in which everything is related to everything else—internally as well as externally. He was assisted in this endeavor by many people, notably for 27 years by Professor Franco Modigliani, a Nobel laureate in economics at MIT. The resulting work, The Economic Process: An Instantaneous Non-Newtonian Picture, was published in 2002 and has been reissued in a third edition in 2016. For reviews, click here. During the last few years, Dr. Gorga has concentrated his attention on the requirements for the unification of economic theory, policy, and practice calling this unity Concordian economics. He is also integrating this work into political science, which he calls Somism, and culture in general, which he calls Relationalism. 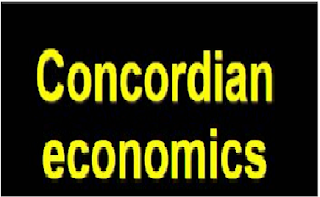 Concordian economics is an integration of theory, policy, and practice. The theory integrates Production of real goods and services; Consumption or expenditure of financial assets to acquire real goods and services; and the Distribution of ownership rights over goods as well as money. The policy integrates the right to participate in the economic process (participative justice); (in order to obtain) the right to a fair share of what one produces (distributive justice); and the right to receive an equivalent value of what one gives (commutative justice). The practice integrates economic rights and responsibilities in relation to the four modern factors of production. 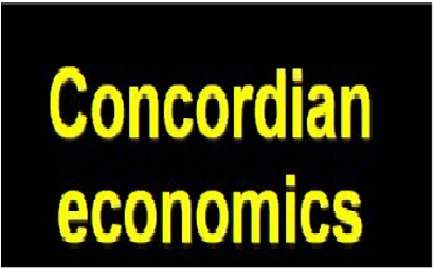 Concordian economics was born in 1965, when, after a summer of intense intellectual struggle with the General Theory, the writer inserted Hoarding into Keynes’ model of the economic system and found himself in a different cultural universe. The procedure is reproducible. We will all obtain the same result. Trouble is economists do not seem able to agree what is that they do. A majority of them seem to be convinced that the science of economics is the study of the Market. Let us see. Why do most mainstream economists believe, as Adam Smith did, that the Market is ruled by an invisible hand leading us gently to a condition of equilibrium and well-being? The reason is that for most economists, as they openly admit, economics is a black box. When analyzed in depth, the results of any theory, on the one hand, plausibly lead to growth; on the other, they lead to stability; and on the other they lead to decline. Economists do not know what happens within the box. And no one ever will because Saving in its incarnation as money deposited in a bank is Investment: It is the lowest form of investment. As a result of fifty years of in-depth analysis, which started with the (re)introduction of Hoarding in economic analysis, the writer has designed a set of tools that allow us to look inside the black box. Professor Franco Modigliani, a Nobel laureate in economics at MIT, and Professor M. L. Burstein, among many other experts in a variety of disciplines, have assisted this research, respectively for 27 and 23 years. Inside the black box, one finds, not an economic theory but the operations of the Economic Process. As pointed out in a book,4 which is now in its third edition, and in numerous papers published in peer-reviewed (albeit rather obscure) journals,5 the central understanding of the Economic Process results from the integration of Production of real goods and services, the Distribution of ownership rights over real and monetary wealth, and Consumption or expenditure of monetary wealth to acquire real wealth. Even in the sale of a car, we have these three items: car, money, and deed of ownership. This is true theory: It is an accurate description of facts. Production ↔ Distribution ↔ Consumption. Figure 3 catches the economic process at the moment of the exchange. It indicates that a cycle of the economic process is completed when the entire production of the period is sold. Then an exchange has occurred between money and goods. For the exchange to take place, both the producer and the buyer, in an ordered society, must be legal owners of the wealth they exchange. Placing Figure 4 next to Figure 3, we realize that this construction of the economic process is nothing new! It is simply a return to the millenarian concern with economic justice, which from Aristotle to the present has been understood as composed of “distributive”” justice and “commutative” justice. Concordian economics allows us to put the capstone on this construction: “Participative” justice. The economic process is nothing but the mirror image of the complete description of three essential principles of economic justice. Commutative Justice gives us a one-to-one correspondence with the consumption process or the process of expenditure of monetary wealth to acquire real wealth. Economic justice keeps the economic process in equilibrium to the benefit of all. Economic injustice keeps the market in disequilibrium to the detriment of all. Short term benefits to the few from injustice are ephemeral. An overview of long term trends makes these relationships quite clear. This figure suggests that, since they are relatively easier to create, the rate of growth of assets composing monetary wealth (MW) is faster than the rate of growth of assets composing the category of real wealth (RW). And then there is the problem of the accelerating pace of concentration of the distribution of ownership (DO) rights into a few hands—a phenomenon which at first cut is here assumed to be constant. Clearly, when monetary wealth is concentrated into a few hands, not enough money will be available to the majority of the population. The necessary equilibrium conditions implied in the P ↔ D ↔ C equivalence for the economic process as a whole, as represented in Figure 3, is broken and the process will not proceed organically forward. Indeed, a bubble is created. The economic bubble is clearly visible from Figure 5: A bubble is a separation of monetary wealth from real wealth and is measured by the area between MW and RW. As pointed out elsewhere, in Concordian economics these values are kept separate and distinct from each other by defining them respectively as p-values (for values of the real economy), c-values (for values of the monetary economy), and d-values (for values of the legal economy or values of ownership rights). How can equilibrium be restored? If we are not misled by reductionist thinking of minds accustomed to analyzing linear trends only, we discover not one but four horses of inequality wandering all over the lot and leaving behind, instead of simple geometric patterns, a filigree of incredibly subtle interrelationships. (4) Labor in its variegated manifestations of manual labor, intellectual labor, and (spiritual?) labor as in entrepreneurial leadership. These are the modern factors of production. It is only natural that human beings should attempt to get as much control as they can over each one of these factors. Inequality ensues. Control over the factors of production has never been and never will be distributed equally among all human beings. That is a false, misleading, and dangerous ideal. Within limits, inequality is natural. No two snow flakes are alike. Human beings, as well as specific plots of land, are endowed by our Creator with different measures of qualities and quantities. It is natural that we are going to get unequal results. What we need, and what the world stands for, is equality of opportunity. Privileged access to the wealth of others. Each one of these privileges—historically rooted mostly in plunder and conquest—has to be turned into a universal right for everyone, if we want to build a just and ordered society. We can then forget the past, and concentrate on the present and the future. The opportunity is ours. We only need to realize that, while privileges divide, rights unite. Rights unite because they are born out of the exercise of corresponding responsibilities. No other economic rights or responsibilities seem to be essential. The consistent assumption of these four responsibilities is all that can and ought to be ingrained into government policies—at various levels. These four policies, gradually pursued, will yield all the certainty and economic security that we need, because they foster structural changes that create conditions of economic freedom and justice for all. As an unearned consequence, the need for Hoarding will almost be rooted out of existence. A fringe of misers will always be with us. But when the majority of the population does not copy the miser, the damage will be minuscule. (4) business people who want to gobble up the fruit of other people’s effort. Where are they? Apart from their miniscule apparitions, when measured against the billions of entrepreneurs who behave morally, they are four phantoms—but more dangerous for being ingrained in the imagination of people who, blinded by their institutional power, see neither economics nor morality clearly. READ: tax assessors, politicians, and academicians who, unable to speak truth to power, make themselves powerless and paralyze entire nations. You might think that this writer is a lone ranger roaming these vast expanses of economic territory—all alone. Nothing could be farther from the truth. He has consistently been serving four Masters of Economics. Four great American Masters of Economics. Forget Keynes… Forget Hayek. For the control of land and natural resources, we all ought to be devoted servants of Henry George. By the way, mirabile dictu, do you know that not one but eight Nobel laureates in economics endorsed Henry George’s prescription to tax the value of the land….…while reducing taxes on buildings and, eventually, income? For the control of money, with its relevant inscription into Article 1, Section 8 of the US Constitution, we all ought to be devoted servants of Benjamin Franklin. For the control over the fruits of one’s labor, we all ought to be devoted servants of Louis O. Kelso. For the control over such basic industrial tools as the corporations (physical capital), we all ought to be devoted servants of Louis D. Brandeis. The writer actually did his dissertation at the University of Naples on the political thought of Louis D. Brandeis; his work was awarded a Council of Europe Scholarship; and he entered the academic awards wind tunnel, in which he even caught a Fulbright Scholarship. This is not "my" vision, says the writer. He does not claim originality. This is the vision that unfolds mathematically by inserting Hoarding, the core of the Parable of the Talents, into the structure of economic theory. Once the root source of Concordian economics became clear to this writer in 2006 (! ), to analyze what else did Jesus, Moses, and St. Thomas Aquinas thought about economics became an intellectual necessity.6 That is a train of thought, explored mainly on the pages of Mother Pelican, that has led to the conclusion that there is no such thing as religion without economics and ultimately to a book titled The Centrality of the Resurrection. Thus Concordian economics is on the cusp of some serious cultural developments. Confucius and Orwell might say that perhaps the most important long-term contribution of Concordian economics is to bring the language of economics in line with the language of common mortals. Stated more directly, Concordian economics adds clarity and reduces possibilities of corruption in the daily interface between economics, politics, and culture. Perhaps, this is a worthwhile New Year resolution to make. Let us abandon the dangerous misconceptions of mainstream economics. Let us wholeheartedly plunge into the new/old world of Concordian economics. 1. Carmine Gorga, 2014. “Economics of Morality” at www.researchgate.net/publication/267569298_Economics_of_Morality. 2. John Maynard Keynes, 1936. The General Theory of Employment, Interest, and Money. NY: Harcourt, p. 36. 3. At p. 328, this is what Keynes (op. cit) said: A "view" which considers that saving is not equal to investment is "more usually supported by arguments which have no foundation at all apart from confusion of mind." This I took to be not a scientific explanation, but a dogma. 4. Carmine Gorga, 2002. The economic process: An instantaneous non-Newtonian Picture. Lanham, Md. and Oxford: University Press of America. Third expanded paperback edition 2016. For reviews, see http://www.carmine-gorga.us/id18.htm. 5. See, esp. Carmine Gorga, 2009. “Concordian Economics: Tools to Return Relevance to Economics.” Forum for Social Economics, vol. 38, issue 1, pages 53-69. 6. The economic profession is waking up to the need to analyze many aspects of the relationship between economics and religion. See, Shiya Iyer, “The New Economics of Religion.” Journal of Economic Literature 2016, 54(2), 395-441. Yet, because of ideology and political correctness perhaps, the analysis of the economic content of religions is still missing from academic investigations. 7. See, e.g., Daniel W. Drezner, “The state of macroeconomics is not good.” The Washington Post, September 15, 2016.